Let’s be honest, who hasn’t purchased a wine based on its name or label? For me, in the case of Sexual Chocolate, it was a matter of both and the wine actually turned out to be pretty tasty. However, if you’re looking for more info on a wine’s inner beauty, then there are a variety of wine apps out there (including at least four that are specific to Virginia) that allow you to access information on the go. Recently, I had the chance to try out Hello Vino. According to their website, Hello Vino is a free app that “provides recommendations for wine to pair with food, wine for occasions or gifts, and also suggestions based on personal taste preference.” There’s a version for Apple and Android devices as well as a mobile web app for other devices like Blackberry and Windows phones. One evening, after taking a sip of a surprisingly good bottle of wine, I decided to give the app a try. 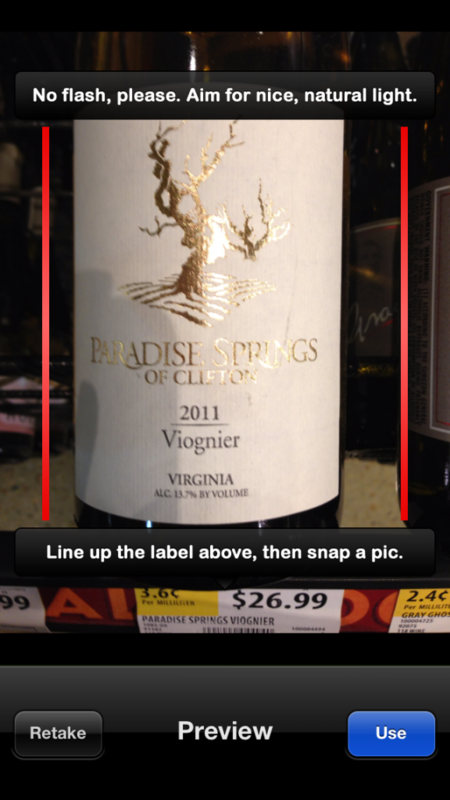 Using Hello Vino’s label scan feature, I snapped a picture of the label. The app displayed the name (Qupe Syrah) and once I clicked on it, it pulled up information on where it came from, a rating, and suggestions for food pairings. Qupe, which is based in Santa Maria, CA, produces about 40,000 cases a year. I wondered how Hello, Vino would do with some local Virginia wines where production is smaller. 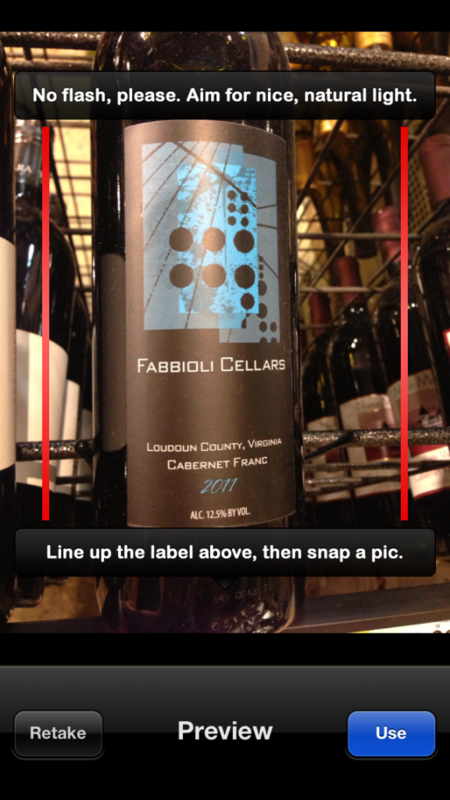 Using four different Virginia labels, I put Hello Vino to the test. 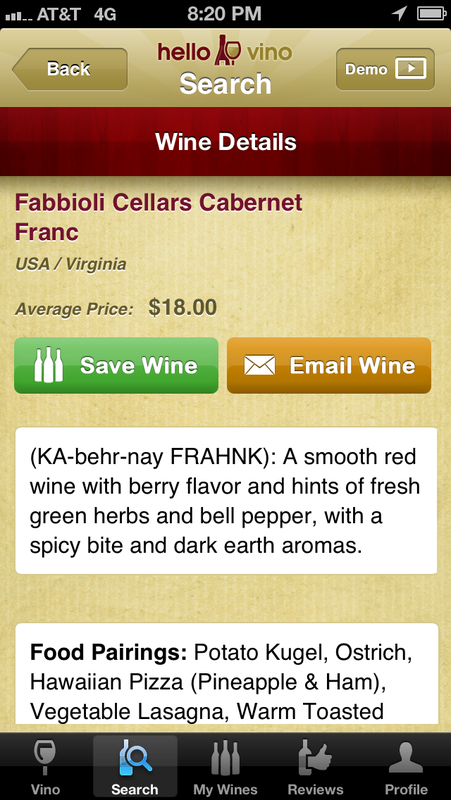 Round One: 2011 Fabioli Cellars Cabernet Franc – This is one of my favorites from Loudoun County, VA. 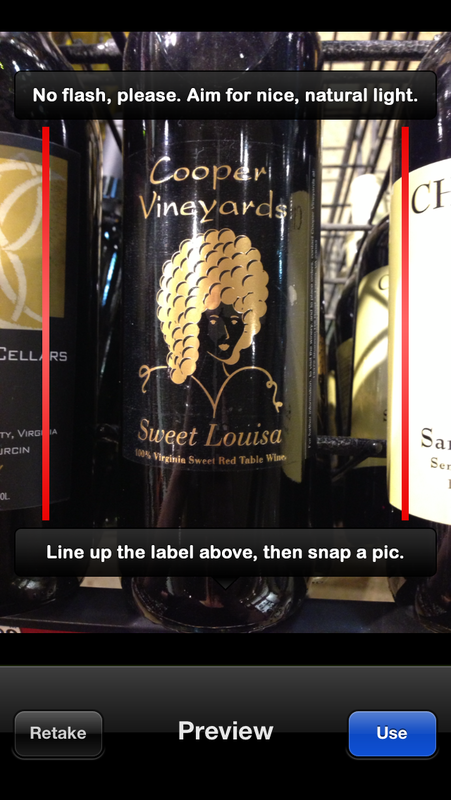 The app is pretty intuitive, so after selecting the “Wine Label Image Recognition” tab under the Search menu, all I needed to do was follow the instructions on the screen and snap a pic of the label. Success! Hello Vino found a match and was able to provide information on pricing, general tasting notes, and recommended food pairings. 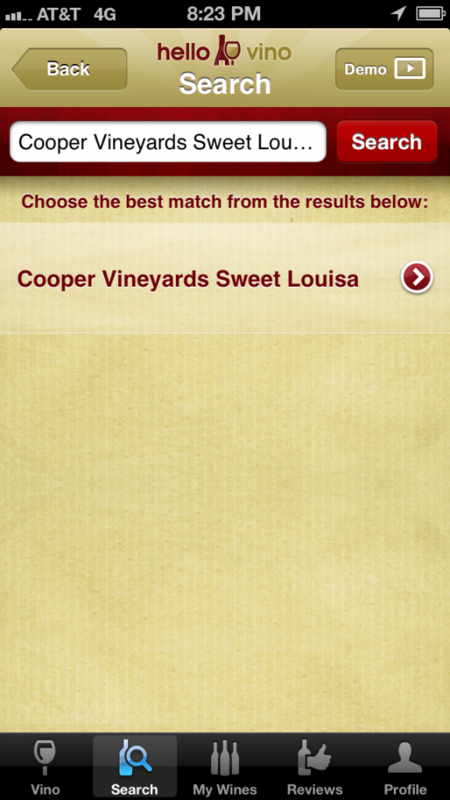 Round Two: Cooper Vineyards Sweet Louisa – it took me a couple of tries, but Hello Vino eventually recognized the label. Round Three: 2011 Paradise Springs Viognier – Unfortunately, Hello Vino didn’t recognize the Paradise Springs label. I typed in the name of the wine and while other Paradise Springs wines came up, the Viognier was not on the list. Round Four: 2011 Glen Manor Cabernet Franc – The label scan worked and Hello Vino was able to provide additional information on the wine. 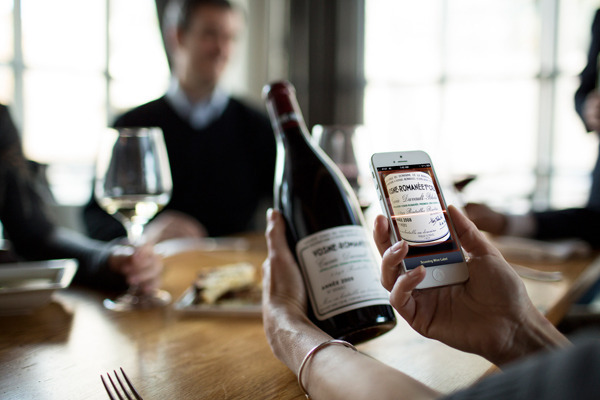 Whether you use the label scan function or type in the name of the wine, once Hello Vino finds the information on the wine, you can save it to your “My Wines” profile and share it with friends on Facebook or Twitter. 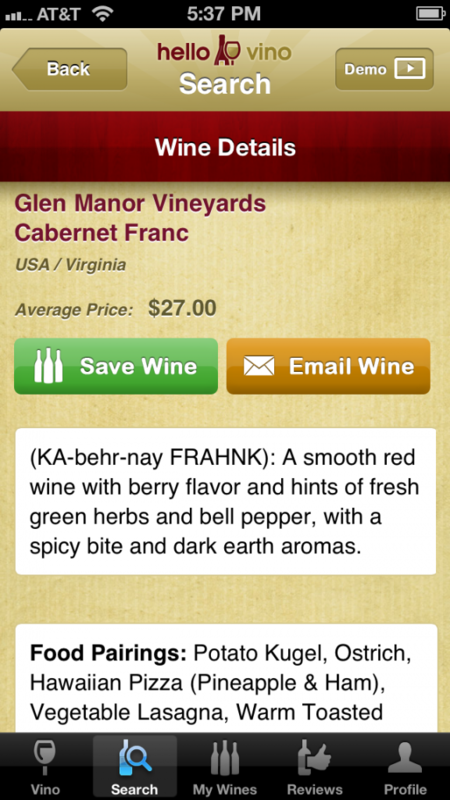 The app also allows you to add a personal rating and notes in case you want to remember where you purchased the wine. While the app itself is free, the label recognition feature requires a small fee. I decided to purchase 20 label scans for $.99 to try it out, but for a few dollars more, you can get unlimited scans. I decided to use the app at a recent Virginia-centric wine festival and it proved to be a pretty handy tool to keep track of what I was sipping. In most cases, I was able to scan the label or type in the name of the wines I liked and save them for future reference. Overall, I think Hello Vino is a pretty useful tool for keeping track of good wines on the go. It’s also designed to suggest food pairings as well which could come in handy if you’re trying to impress your dinner guests; however, more advanced wine drinkers may find the information Hello Vino provides limited. 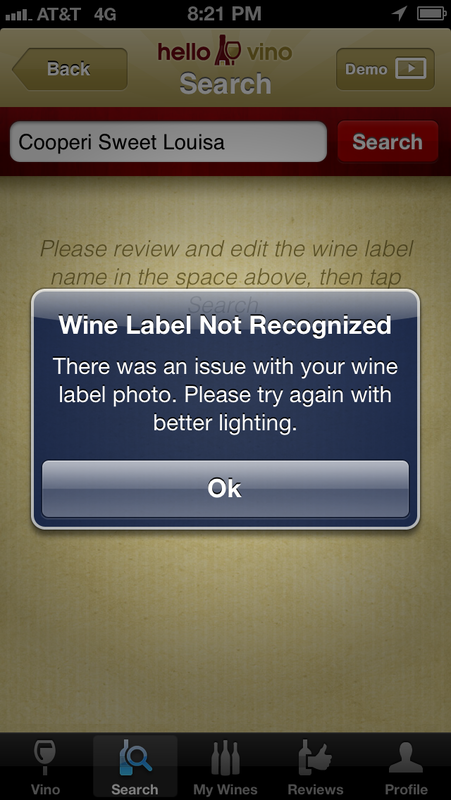 Also, Hello Vino doesn’t allow you to save pics of the wine labels you scan and while the app does include stock photos of the wines in its database, it did not have pics of any of the Virginia wines I tested. For someone like me who has an easier time remembering a label than a name, this can be an issue. As I mentioned earlier, there are a variety of wine apps to help you learn about and track what you drink and many of them offer similar features. For my purposes, Hello Vino delivers the basic functionality that I find comes in handy and it’s got a price that’s hard to beat. Has anyone else use Hello Vino? What was your experience? What about other wine apps – any recommendations?